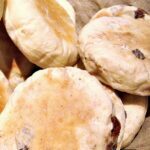 I love English Muffins! When I lived in England, I would often have these toasted with just a simple spread of butter, or make a bacon and egg muffin from them. When they are freshly cooked, they taste just wonderful. I also like these toasted lightly, just by pulling them apart at the waist and toasting on the insides then letting some butter melt on them. Ahhhhh English Muffins! 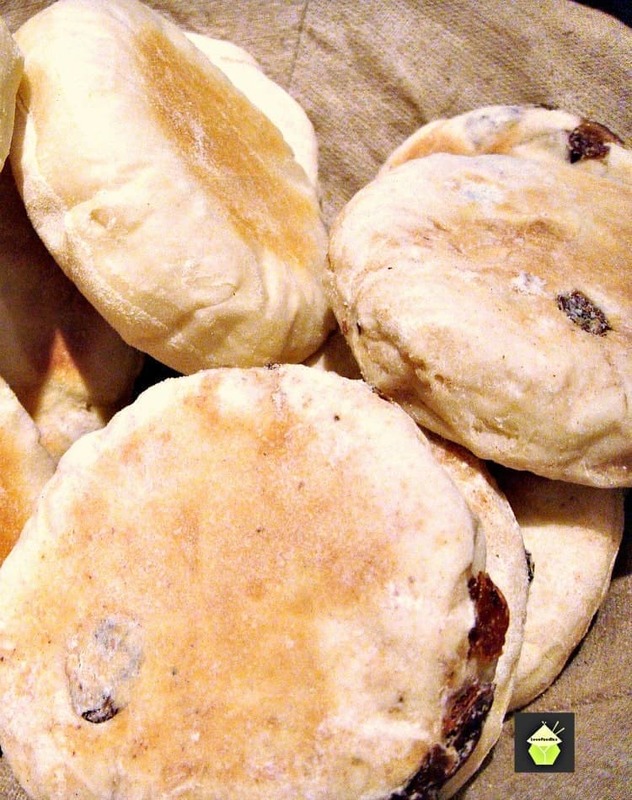 Here I made some with raisins and cinnamon, and it certainly is a wonderful combination! 2. 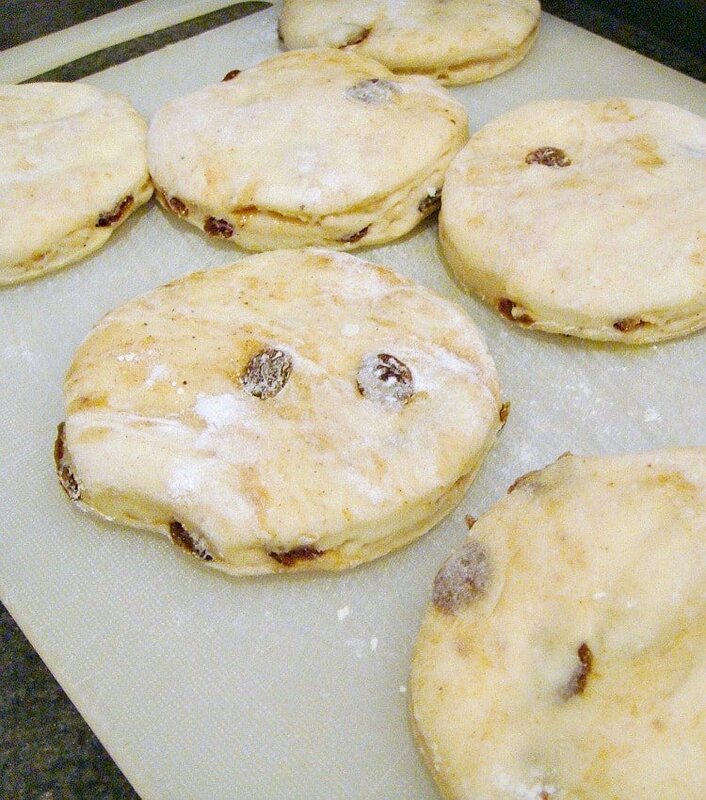 Sift the flour and salt into a large mixing bowl, add the raisins and cinnamon, then make a well in the centre then pour the yeast mixture in then mix until a soft dough forms. To tell if it is mixed enough, the dough should not stick to the sides of the bowl. If it’s still a bit sticky add a bit more flour, or if it’s a little dry, add a drop more water. 3. Once you have a soft dough, knead for 10 minutes by hand or using a stand mixer on medium speed until it is very smooth and elastic. Cover and leave in a warm place until the dough has doubled in size. This will take about 45 minutes. 4. When the dough has risen, lightly flour your work surface, then place the dough out and roll it out to about ½ inch (1 cm) thick. *** do not start kneading the dough, just place on the table and roll! 5. Using a 3 inch (7.5 cm) plain cutter, cut out 12 rounds, any off cuts, add them together and re roll to form more rounds. 6. 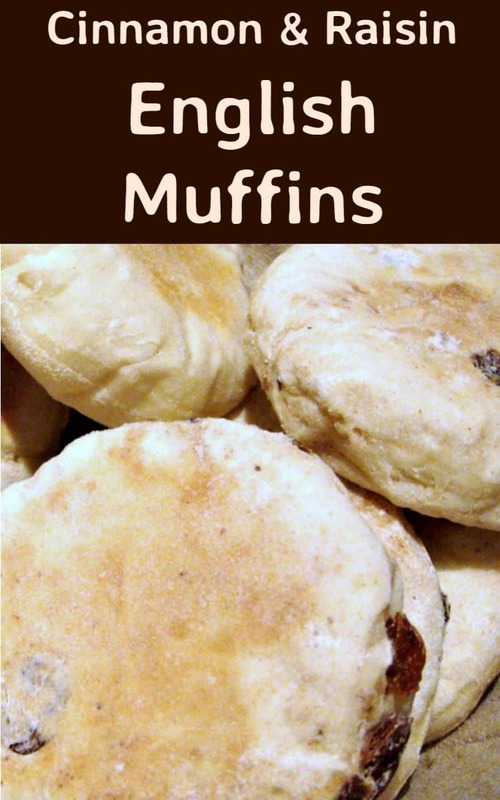 Place the muffins on an lightly floured baking sheet, sprinkling them with a little more flour, then leave them to puff up and rise again for about 25-35 minutes in a warm place, cover with a clean tea towel. 7. When ready, apply some oil on a bit of kitchen paper and lightly grease your pan or griddle. 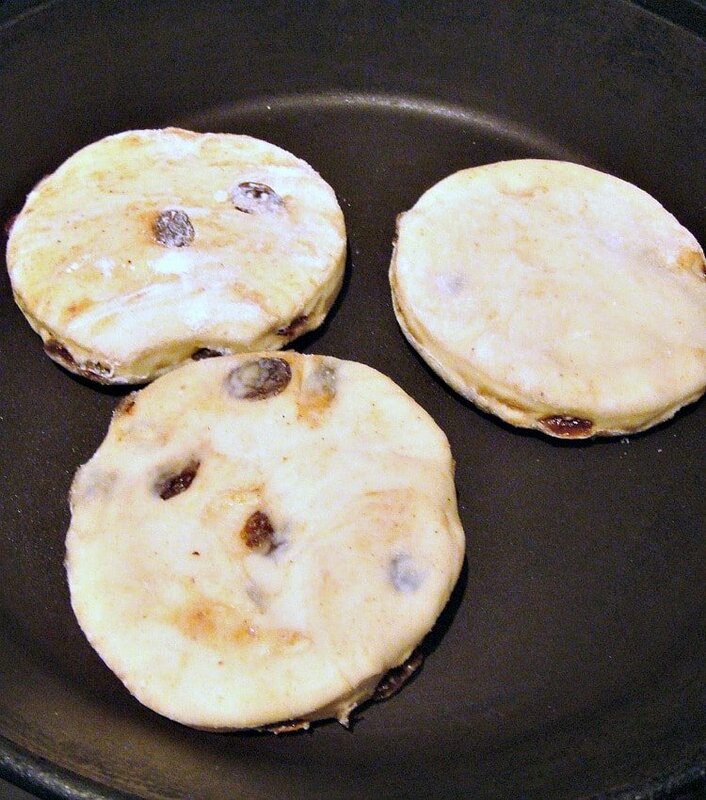 Heat the pan on medium heat and place muffins on the pan. As soon as you place the muffins on the pan, turn heat down to low so they have a chance to cook in the middle, leave them for around 7 minutes, then turn them over for a further 7 minutes. Depending on the size of your pan, you might have to do a few batches. I used a pan and also my long griddle on the stove top. They should be slightly golden, but not brown all over. To serve, pull them gently apart at the waist and spread some butter and or jam and enjoy! These are best eaten when fresh. If you store in an airtight container, you can use them the next day, but I would suggest to toast them on both sides first to warm up. 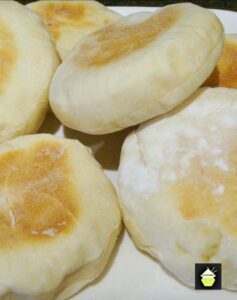 Here I also made some Plain English Muffins, and I think they are most delicious served warm, split open and just add a spread of butter on each side. Really delicious! If you would like to see the recipe, just click on the photo opposite and we’ll take you there! In a jug measure out the milk and water, and place in the microwave for 40 or so seconds. It needs to be warm to touch and NOT hot. 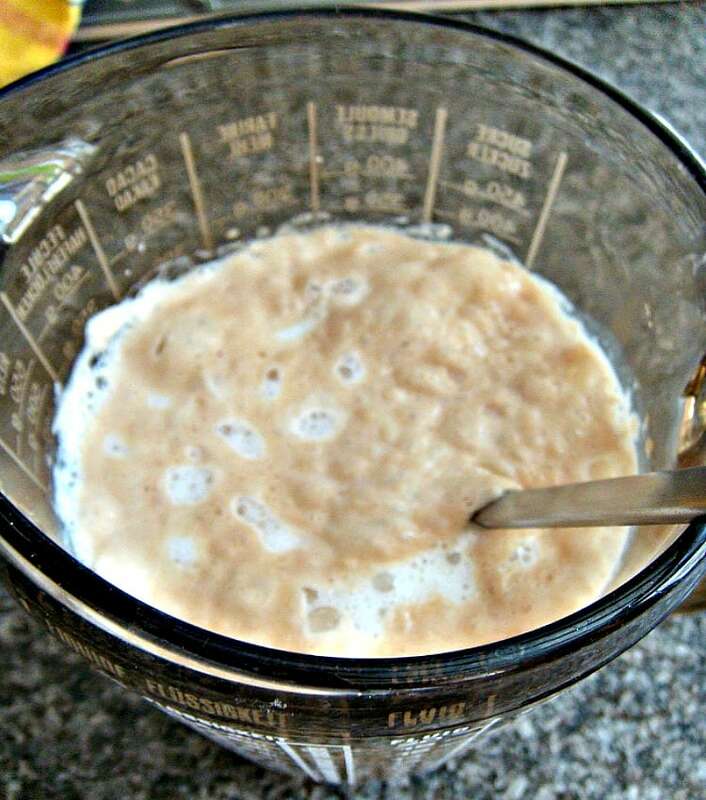 Then add the sugar and dried yeast and leave it in a warm place for 10-15 minutes till there is a good frothy head on it. (see photo). Sift the flour and salt into a large mixing bowl, add the raisins and cinnamon, then make a well in the centre then pour the yeast mixture in then mix until a soft dough forms. To tell if it is mixed enough, the dough should not stick to the sides of the bowl. If it's still a bit sticky add a bit more flour, or if it's a little dry, add a drop more water. Once you have a soft dough, knead for 10 minutes by hand or using a stand mixer on medium speed until it is very smooth and elastic. Cover and leave in a warm place until the dough has doubled in size. This will take about 45 minutes. When the dough has risen, lightly flour your work surface, then place the dough out and roll it out to about ½ inch (1 cm) thick. *** do not start kneading the dough, just place on the table and roll! Using a 3 inch (7.5 cm) plain cutter, cut out 12 rounds, any off cuts, add them together and re roll to form more rounds. leave them to puff up and rise again for about 25-35 minutes in a warm place, cover with a clean tea towel. When ready, apply some oil on a bit of kitchen paper and lightly grease your pan or griddle. Heat the pan on medium heat and place muffins on the pan. As soon as you place the muffins on the pan, turn heat down to low so they have a chance to cook in the middle, leave them for around 7 minutes, then turn them over for a further 7 minutes. Depending on the size of your pan, you might have to do a few batches. I used a pan and also my long griddle on the stove top. They should be slightly golden, but not brown all over.